During the late night of Saturday, May 24, 2014, a meteor shower was predicted to take place. Therefore, my dad and I decided to go observe the new meteor shower. 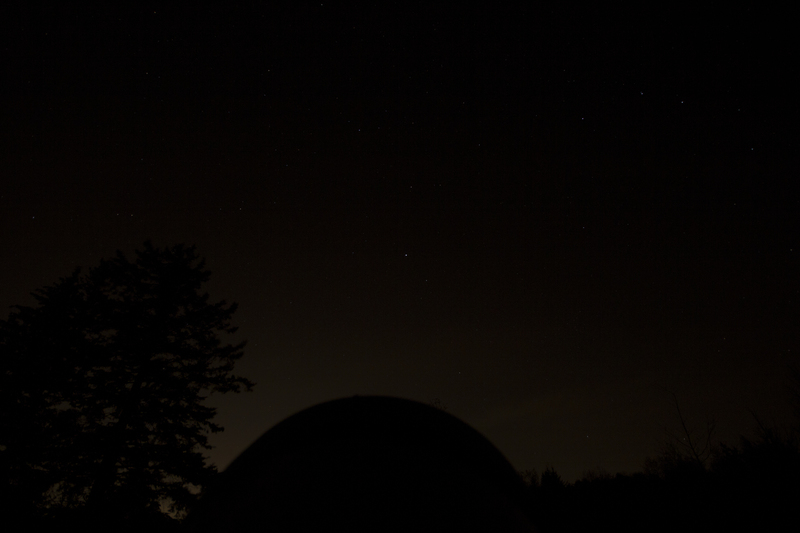 Hearing about a RASC event earlier, we decided to go to Glen Major Park to observe the meteor shower. Before we arrived there, we stopped at two other places. The first was a road off 16th Avenue. This area was where we had observed the skies in the past. However, for viewing the meteor shower, I didn’t think it was dark enough to view the night sky. My dad agreed with me. Therefore, we went further towards Glen Major Park. We next stopped in a field of grass. The sky was much clearer there. It made a world of difference being farther away from Markham. There, I saw a meteor flying by, and I saw another object. This object was streaking through the sky at a constant rate. It was a dim object. I believe it was a satellite. It was dim enough to be mixed into the stars, but I was able to see it. It was amazing to see it in skies that were light-polluted a few kilometres away. Despite the beautiful view, we decided to move forward to Glen Major Park. We soon arrived in Glen Major Park in Clairmont. There, we heard the voices of other RASC members, who were enjoying the meteor shower that night. The sky was full of stars in the sky. I believe that it was dark enough to be able to clearly image the Milky Way. My dad and I, for a while, looked at the night sky to find any meteors shooting through the night sky. Then my dad pointed out that it is a darker sky and that M51 must be more visible now in the darker sky. He was right, and I decided to focus on imaging M51. I removed the DSLR Camera from the piggyback mount to the telescope using a t-adapter. We pointed it towards the handle of the big dipper. We then slewed the telescope to the area where M51 is. We took a few images of that area. We couldn’t see it using Liveview, therefore we needed to take the long exposure images. After taking a few long exposure images, I looked at the images, and for some of those pictures, I saw two blurry objects close together. This led me to the conclusion that I had imaged M51. I was truly happy as I finally captured the most elusive Messier object I have ever seen. After capturing M51, I decided to take long exposure images of the night sky. My dad suggested that I image Cassiopeia, which I did. The images were quite dim, but the camera was able to collect enough light to get a good image. However, unexpectedly, I saw a bright star moving fast across the sky. It was the ISS flying through the sky. It was amazing to see the ISS again moving so fast and so high across the sky. I was able to get a 30 second exposure image of it streaking through the sky. It was a beautiful sight. Eventually, it fell below the horizon and disappeared. We soon returned to imaging Cassiopeia. 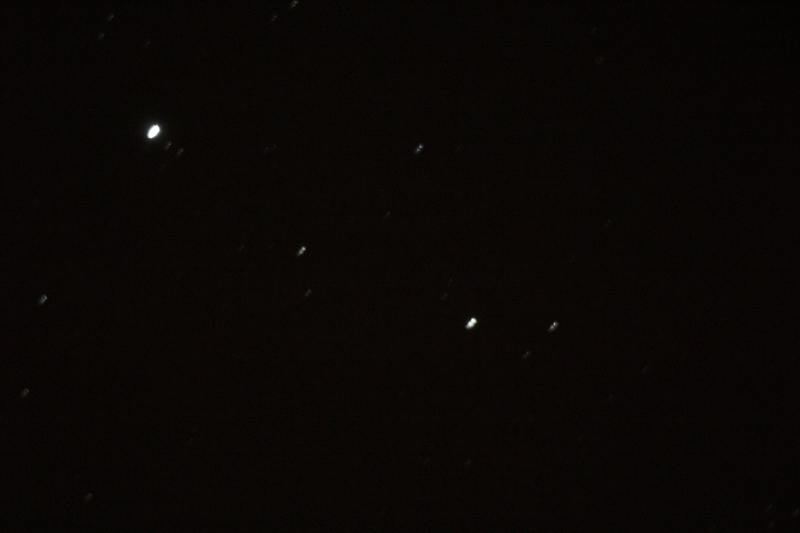 I was able to get four good images of Cassiopeia. It was spectacular. After those images, we noticed the rising crescent moon in the eastern sky. It was beautiful, especially when it was low in the horizon. I was able to image it, but there were too many clouds in the way. At that time of the day, the moon’s rising means that it was around 3-4 am. At that time, we decided to pack up the telescope, and head home. It was a wonderful night. We saw a lot and learned a lot more. Looking at the pictures, many turned out great, with the exception of the M51 images. 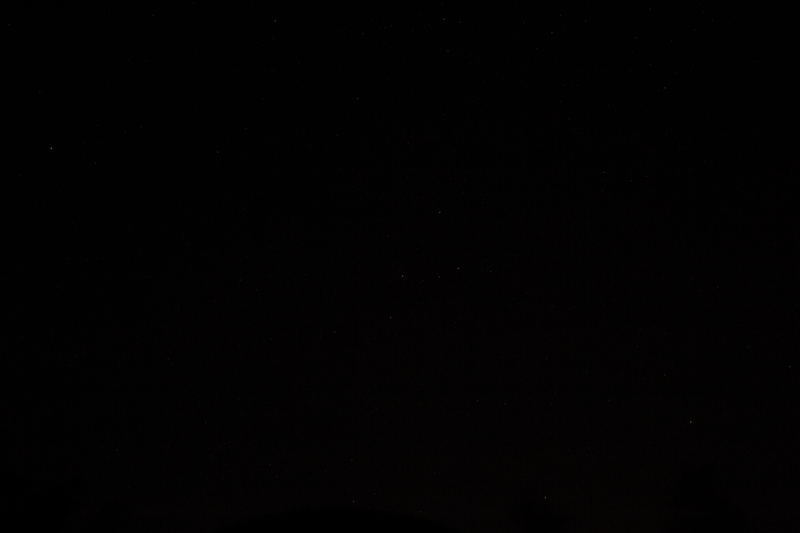 I realized that they were actually stars that were warped when the camera shook during its capture. It was heartbreaking, but what could I do? The journey to find M51 still goes on. However, I was able to see many more objects in the sky with my dad. It was breathtaking and a great time. I advise anyone who is interested in viewing clear skies to go up to Glen Major Park or Long Sault Conservation Area for the best clear skies according to RASC. Good Luck and Happy Observing! On Sunday, May 18, 2014, during the Victoria Day long weekend, I was up in Sudbury with my family. We were blessed with beautiful night skies, and as a result my dad and I decided to take advantage of it and observe the night sky. We went outside to a clear area in our surroundings. After setting up the scope, it was ready to align. We saw very unusual objects. There were fast moving objects in the sky moving as a group. We thought they were UFO’s at first, but we realized that they were birds flying across the sky. It was unusual to see these birds illuminated at night, even though Sudbury is a pretty dark place. However, due to the construction around the land, there were a lot of lights pointed towards the sky. Those lights illuminated the birds quite brightly, which led to that confusion. After clearing that up, we continued on with our astronomical goals. We first aligned the telescope with Mars. 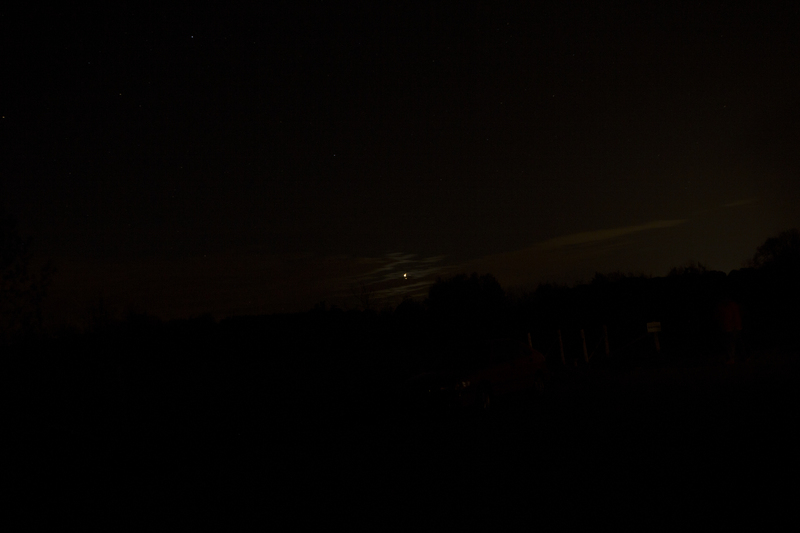 Looking at Mars, it was a beautiful red dot that shined brightly in the sky. Unfortunately, we couldn’t make out any details on it. Looking at the sky, we also found Saturn and Jupiter in the sky. Saturn was moving upwards away from the horizon, and Jupiter was moving towards the horizon. From the locations of Jupiter, Saturn and Mars, I drew a line between them to see where the ecliptic was. The ecliptic is the path the sun takes when it rises and sets every day. I was able to estimate the location of the ecliptic, because all the planets orbit close to the plane of the sun, thus we see the rising and setting of planets near the same location as the ecliptic. It is quite interesting. After realizing that, we soon decided to slew to Saturn. After slewing to Saturn we saw a brilliant planet surrounded with beautiful rings. It was a sight to see, especially up in the Sudbury sky. Looking around for another target, we saw a star that was flickering in the atmosphere between different colours. It was intriguing to my dad and me. I thought it was a variable star. However, my dad believed it was a star that was so low in the atmosphere that the atmosphere was dispersing the light. I’m not certain, but it could be it. We slewed to it and saw the fluttering star. However, at midnight, the clouds started to come in and block the starlight. With that, we decided to pack the telescope back into the truck and return inside. On Tuesday, May 5, 2014, as part of astronomy week, the Royal Astronomical Society of Canada (RASC) hosted a solar observation event at the Ontario Science Centre. I was able to attend this event and observe the sun with a variety of telescopes. Most telescopes are using Baader film, which makes the sun look white, and hides the solar flare and prominences, but clearly shows the sunspots on the sun. Another telescope called the Coronado PST uses a hydrogen-alpha filter. All the light, except the hydrogen-alpha light are filtered out and the sun glows red. The image projected shows the sun, but the sunspots are unclear. However, the solar flares and prominences are visible. Looking at the sun using those telescopes was very intriguing. In my previous blog post, I talked about how the magnetic field of the sun works to form sunspots, prominences, and other solar activity. Going to RASC’s solar observing event gave me the opportunity to observe what I wrote about. I was able to see the sunspots. They were close enough to look like an arc was there. On the Coronado PST, there was a prominence or a flare visible from the top right of the image. It was an amazing feeling to see the sun so alive and so active. The Sun through Hydrogen-alpha filter via Coronado PST. It’s not just the planets that have magnetic fields. The Sun also has a very large and dynamic magnetic field. The sun’s magnetic field is formed much like on Earth and Jupiter. There are convection cells that bring heat from the sun’s heat sources to the surface. These convection cells, and the sun’s rotation period of 25.4 Earth days produce the sun’s magnetic fields. However, there are many notable differences. These granules on the sun are convection cells. The sun is over 12,000 times larger than the Earth, which means that its magnetic fields are larger as well. It’s so large, it extends past the orbit of Pluto. However, it isn’t a solid object, like Earth. The sun’s material is mostly plasma, which works like a gas; like Jupiter. This means that the sun experiences differential rotation, where the equator rotates faster than the poles. On the sun, its Equator rotates every 25.4 days, but its poles rotate every 29 days. This video will demonstrate what that does to the sun. When the sun rotates, the equator stretchs the magnetic field lines towards the sun’s direction of rotation, and it will keep stretching it until they snap like rubber bands. When they snap, they release the energy in the magnetic field and the magnetic field lines pop out of the sun. These magnetic field lines cause the charged particles from the surface to become trapped along the magnetic field lines. Those trapped particles are called prominences. In addition, Sunspots are formed where the magnetic field lines poke out and in, when the charged particles are lifted from its surface. That is why sunspots are common during periods of high solar activity, like the Solar Maximum. Eventually, the magnetic field lines will reconnect with each other, and release a lot of energy, leading to large solar flares, and coronal mass ejections. At the same time, the polarity of the magnetic fields will reverse. When the flip is complete, the sun’s magnetic field will drop to zero, reappear in its reversed polarity, and start the process again. This process occurs every 11 years and after each cycle, the poles reverse. Today, there is evidence that the Sun’s magnetic field is in the process of flipping after a chaotic solar maximum. Once the flip is complete, the process starts again. Thank you for reading! For my next topic, I want to hear from you. What do you want me to write about next time? You can respond by going to the contact form at: http://www.jolyastronomy.com/contact-me/ Thank You.